HAPPY MAY DAY 2014 - Seattle says $15 an hour is fair! We are one week out from the 3rd Annual Workers Unite Film Festival and all the fine tuning took a short break today as we went out to join thousands of workers in NYC and millions of workers around the world, celebrate the original workers day of solidarity. We were thrilled to see so many thousands of our union brothers and sisters marching down Broadway and filling the plazas around City Hall in NYC with their strong and clear voices calling for Solidarity Forever, A living Wage and safety and dignity on the job every day at work. We were also thrilled to know that as we were celebrating in NYC and calling for a new, livable minimum wage, workers in Seattle, after much hard work, have won at least the start of programs and laws aimed at making a $15 minimum wage a reality in a major American city. Though there have been complaints about the specifics of this new wage bill, it is nevertheless a historic move for a large city to say, enough is enough of income inequality! A person who works 40 hours a week should be able to take home enough pay to support themselves without a second or third job, or need to rely on the government for any kind of public support. It is only in the right-wing bizarro media world that hard work should amount to starving and shame, while the fat cat owners have trouble deciding which second, third, four vacation home they should travel to in their private jet this weekend. And we're crazy to ask for a decent minimum wage. 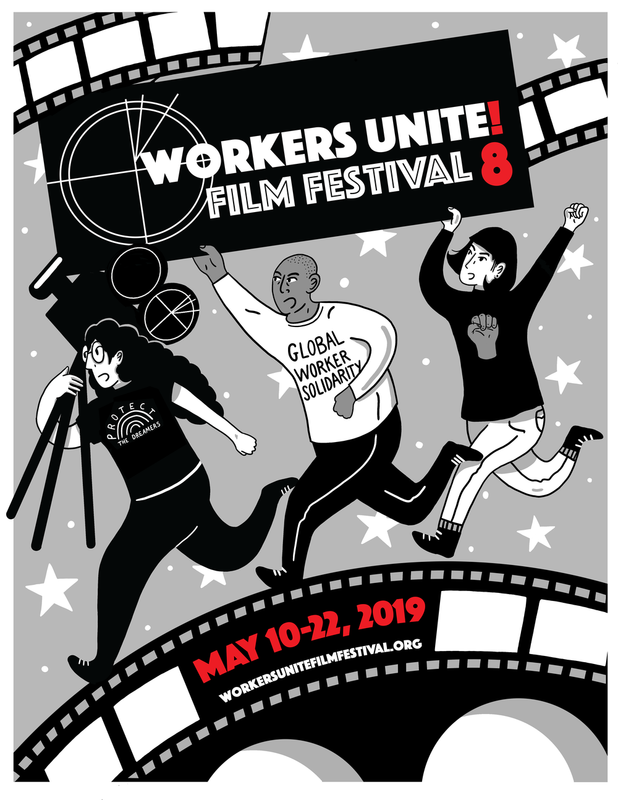 We open our Workers Unite Film Festival in just about a week and have put together and amazing schedule of films, poetry, music and talk that will cover so many of today's current issues on worker's rights and labor rights. We look forward to having you join us for several events. And do not miss the 60th Anniversary screening of a fully remastered copy of "Salt of the Earth." Simply spectacular to watch - even 60 years later! Go to the website - read over the program, buy your tickets in advance onthe Eventbrite links, or the day of the show. We hope you will continue to support the festival by purchasing one of the wornderful and cool 2014 WUFF Tee Shirts. A 420 donation helps the cause and gets you a gorgeous tee for the coming warm weather. Finally. This wonderful group of articles appeared today from Portside. they are each so important to read, but my favorite is how Canadian workers median income has now surpassed that of those in the US ofA. And why? Because despite a concerted attack lately on union rights there? They still have far stronger protections for workers and their unions, which equals better pay and better working conditions. It's not rocket science brothers and sisters. If we want to get our economy here moving, we have to have good jobs at decent pay.